If you’ve never heard of the Californian city of Gardena then you shouldn’t be too ashamed. It lends it’s name to a certain variant of draw poker and from the 1930s to the 1970s contained a vast number of poker tables – some sources suggest more than the rest of the US put together. Gardena Jackpots is a game which was especially popular there during that busy period and ultimately took it’s name from that location. It’s an entertaining form of draw poker ideal for home or casino play. The aim of Gardena is to create the strongest hand according to standard poker rankings with at least three of a kind. The pack also includes a joker. If no player has the required hand then new cards are dealt to each player and more antes are added. In this manner the pot increases, hence the ‘Jackpots’ name. A draw round now takes place during which players can opt to discard and replace any cards; if the player who opened the betting wants to discard one of a pair of Jacks or above he may do so but must keep that card nearby to be able to prove he was allowed to open the betting. This is called ‘breaking openers’. Another round of betting follows the draw after which any players remaining compare cards in the showdown. Winning hands must contain at least three of a kind; if they do not the pot rolls over to the next hand, increasing it further. 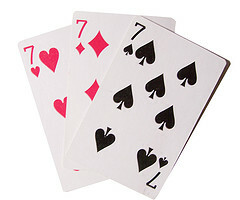 The highest possible hand is five Aces, made by including the joker as an Ace.